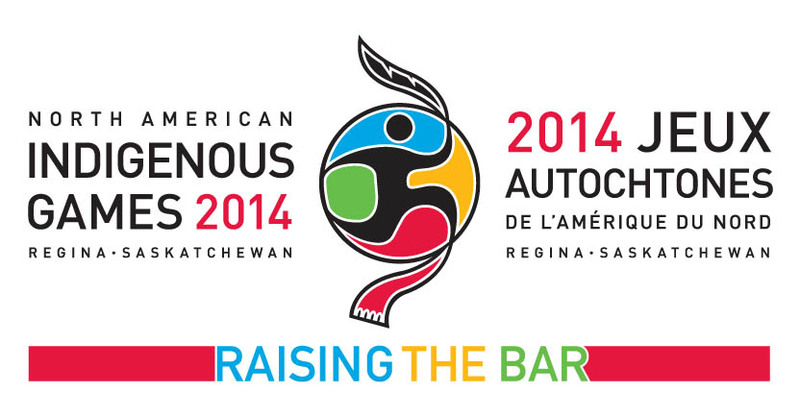 The logo encapsulates all North American Indigenous peoples – First Nations are represented with an eagle feather (top of logo) which can also be interpreted as a torch for the games, Métis are represented with the traditional sash (bottom of logo) and the Inuit are represented with the ulu (traditional knife – right part of logo in yellow). The colours used are also sacred and symbolic to Indigenous people. The final logo design is bold, dynamic and captures the spirit of the Games. This logo was designed by Bravo Tango. The North American Indigenous Games (NAIG) 2014 logo may not be used, or its likeness, for any commercial and or promotional purpose without prior written consent from NAIG 2014. 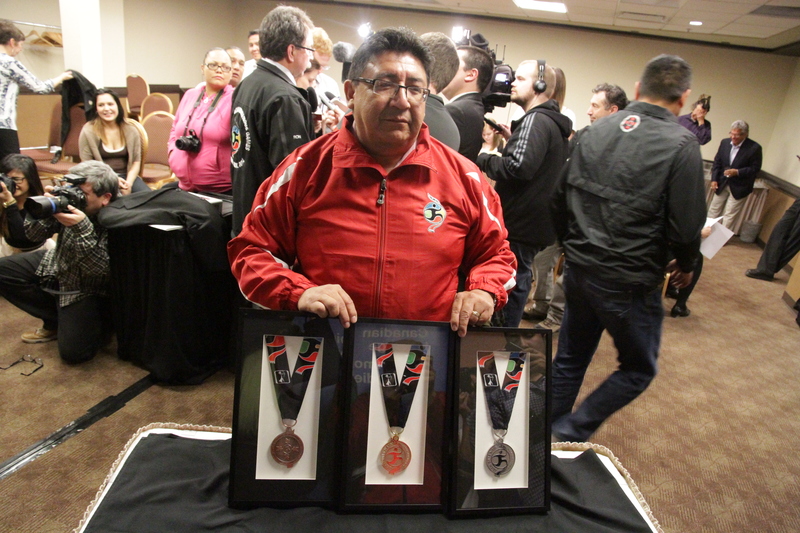 The Regina 2014 North American Indigenous Games unveiled both the official medals and the names of the Symbols. The medals were designed by, Regina Company Laurie Artiss- The Pin People, which will be the official supplier of medals. 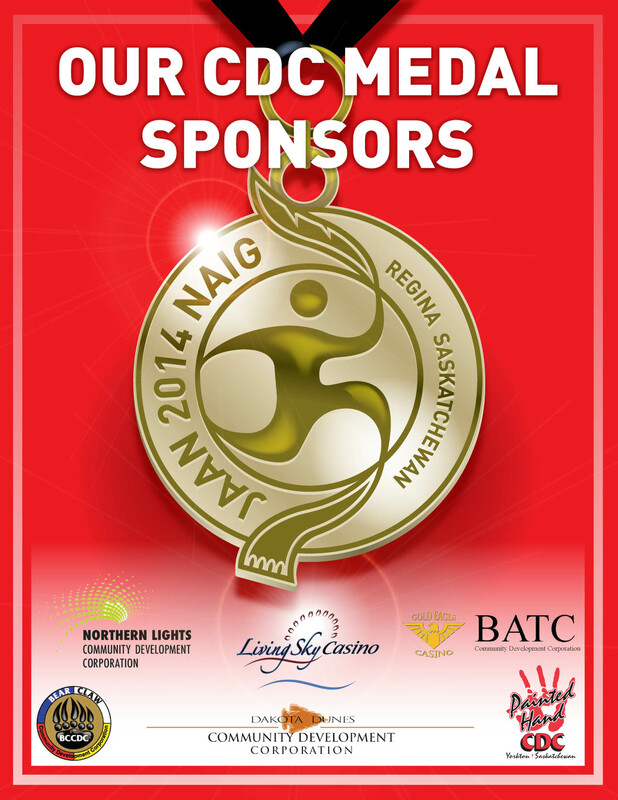 The Medals are being sponsored by the Saskatchewan First Nations CDC (Community Development Corporations Association). The Regina 2014 North American Indigenous Games is extremely honoured to have the CDCs be a part of this very important part of the Games. Saskatchewan First Nation CDC Association Chair Stan Bobb shared his thoughts in this statement. On behalf of the Saskatchewan First Nation Community Development Corporation Association we bring Greetings and well wishes. The CDC’s affiliated with the Northern Lights, Gold Eagle, Dakota Dunes, Painted Hand, Bear Claw and Living Sky Casinos work collaboratively with the communities in their respected areas to support initiatives for our young people in hopes of providing opportunities that will help improve their quality of life. The Boards of Directors of our respective CDC’s understand the importance of supporting our youth and providing a platform to display their highest level of sporting achievements. It is with this thought we are honoured to play a role in this prestigious event. We look forward to seeing you at the venues supporting our future leaders. 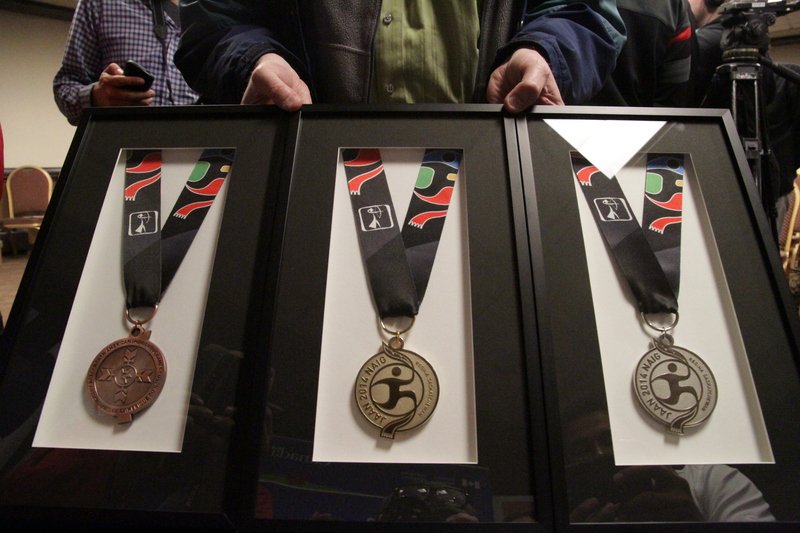 Along with the Medal Sponsorship announcement and unveiling the 2 official Symbols were named and revealed. The naming was accompanied by a story on the names of the two Buffalo.In consultation with our Elders and with the inclusion of ceremonies, the Host Society developed two icons to be unveiled as the symbols.They were created in the likeness of the Buffalo, an animal that is the subject of many legends in Treaty #4 Territory and an animal that is considered Sacred by the Plains Indigenous people of the Americas. On Tuesday, May 6th, a Elder’s Council Meeting was held to receive guidance and support for the naming of our Symbols. We are pleased to announce that the Adult Symbol will be known as “Paskwa-Moostoos” which is Nehiyawewin (Cree) for “Buffalo” and the Youth Symbol will be known as “Tatanka Ci’Stina” (Chis tina), which is Dakota for “Little Buffalo”, collectively the symbols will be known as “Children of the Buffalo Nation”. 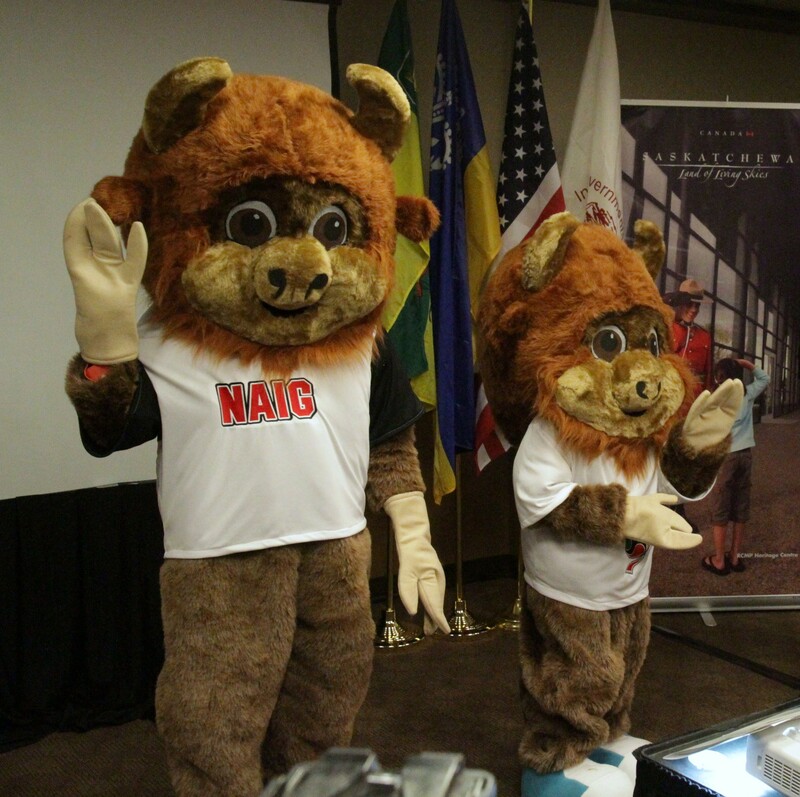 The Elders believe others will use their own languages to identify “Buffalo” and “Little Buffalo” as a means to encourage language retention. In 1882, the site of the future city of Regina, capital of the North-West Territories and of the province of Saskatchewan, was selected. The chosen site was the point where the route of the Canadian Pacific Railway crossed a creek variously called Pile o’ Bones, Tas d’Os, Manybones, and Bone Creek. The creek finally became known as Wascana from the Cree term for bones, Oskana. A few miles downstream, where its valley is more pronounced and numerous cut banks occur, was the “Old Crossing”, a ford on the historic cart trail from Fort Qu’Appelle to Wood Mountain and Cypress Hills. In that vicinity the buffalo bones had accumulated. The pile of bones from the Cree Indian hunts was quite a sight to the early settlers. The bones resulting from the slaughter were carefully assembled into cylindrical piles about six feet high and about 40 feet in diameter at the base, with the shin and other long bones radiating from the center to make stable and artistic piles. During the second half of the 19th century, the Métis also hunted large numbers of buffalo in this area, and the creek was littered with countless bones.